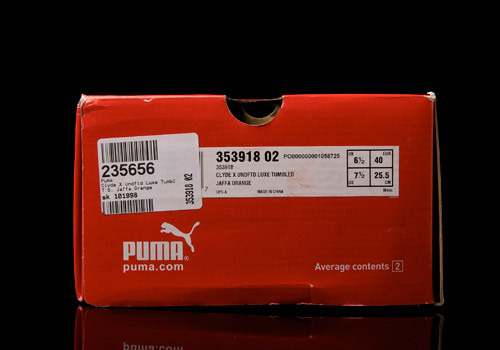 We all know it, the staple of a PUMA shoe – and especially a Clyde – is the formstripe running across the sidewalls with the elegance of a simplistic, yet undeniably full design. 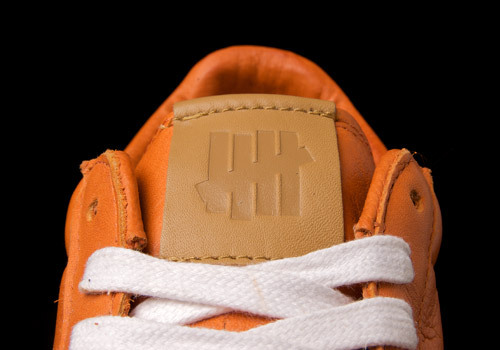 So here comes the Undefeated (UNDFTD) gang to shift our perception away from the most well known mark of the big cat’s corporate identity, and remind us of the true essence imbued within any great sneaker: the shape itself. And shapely these are… but let’s leave that aside for now and discuss their premium details and the designers behind them. From canvas to luxe to NRC ripstop, or coverblock to micro dot, the L.A. born brand has taken no time at all to get quite acquainted with PUMA in a big way. 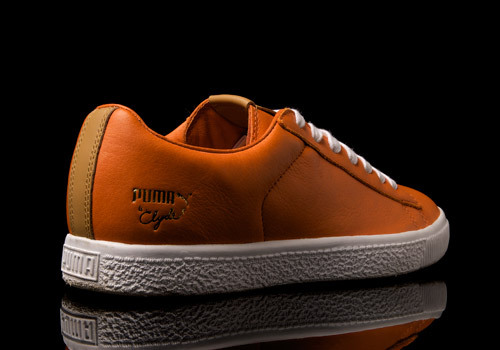 Following their first five packs with the big German cats, the winter 2011 releases were pushed forward with the title ‘Stripe-Off’, including three pairs in navy, tan, and the ‘burnt’ orange pictured here. Something to keep in mind while you’re possibly puking over their bizarre new look is the apparent success of these shoes, as the following spring of 2012 led to part two of the Stripe-Off pack, which included three new colorways: ‘steel’ grey, ‘tawny olive’, and ‘team’ burgundy. Tumbled leather upper, classic white outsole, and low-laying iconography to support both brands appears embossed in the usual places, all making up the sweet, yet so far expected features of UNDFTD’s sixth stab at the fabled Clyde silhouette. 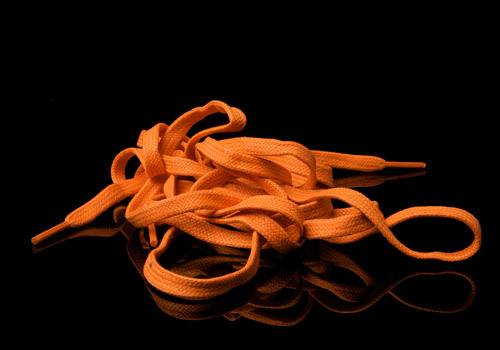 The only major change – besides the grossly obvious lack of a formstripe – is the heel tab, placed inside of the shoe (instead of along the back as usual), adding an appearance of contrast and (supposedly) more comfort for the wearer. 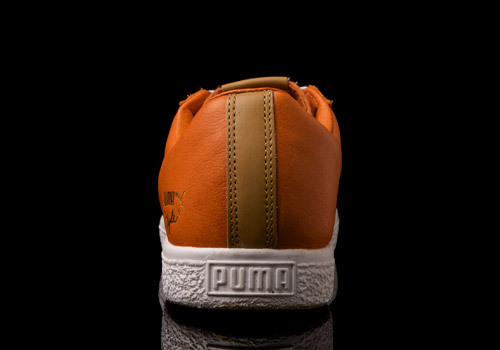 PUMA purists will surely unite and sing their collective soapbox criticisms in unison against the unorthodox urges that placed the formstripe entirely off this pair, but here at eatmoreshoes we gladly promote such experimentation upon classic silhouettes. Yes, it’s definitely recognized that such moves, whilst bold, can (and surely do) disrupt the entire nature of what makes a model so legendary, inevitably losing some nostalgia along the way, however there is merit to be measured in a move so risky. How were classics born to begin with? They most definitely weren’t produced on the path of safe behavior, nor were they created in a traditional or easily imitable light. So, then, we argue, why should such unique moves be considered deranged or destructive when they quite possibly might lead to the next big taste. 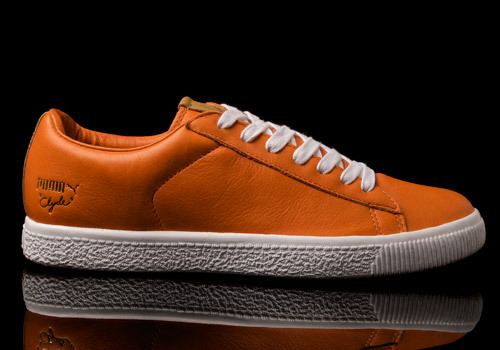 Like it or not, these tumbled leather, UNDFTD Luxe treats are a seriously brave take on the infamous Clyde silhouette. And though we may not have a pair on our feet as we step into the office every day, we certainly aren’t keeping our hats on for these ones either. 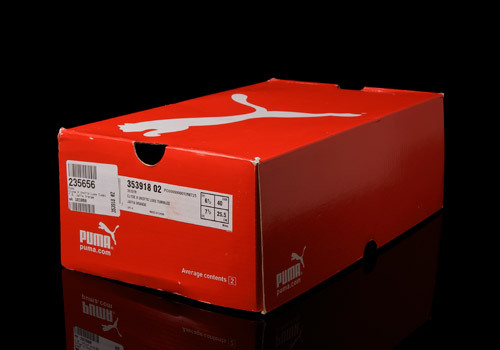 Here’s to you PUMA, for trusting in the direction of another brand to originate as you once did.